The Emotional Journey Through Separation and Divorce – What Should YOU Expect? The emotions you experience during a marriage breakup are usually gut-wrenching and much more difficult to navigate than you expect. Nothing can really prepare you for the intensity of your feelings or the length of time your emotions will be hard to handle. I have found that knowing what to expect and knowing you will get to a better place are the two most helpful ideas for dealing with your emotions through this difficult time. Being a divorce coach, I know that each separation and divorce is a unique situation and people going through the separation and divorce journey will handle their emotions differently but there is a pattern in the emotions most people do experience. The emotional journey through separation and divorce can be thought of as a grief but it is more complicated than grief experienced when someone dies because you have to add the ongoing interaction dynamics to the emotional journey. Both members of the couple usually grieve the relationship separately, but their partner is still involved, and they will continue to interact, react and act out together which can add a lot of misery to the grief. To add to the already difficult emotional journey the timing is often different for each person in the couple. The person that leaves the marriage has often done a lot of the grief work before they make their plans to separate common knowledge. This means that although couples’ journeys are similar they will often find themselves at very different points along the path. This leads to more hurt and frustration as your life falls to pieces and your ex-spouse appears unmoved, or you are ready to move on and your partner is in deep denial and very unready to accept a divorce, let alone negotiate towards it. 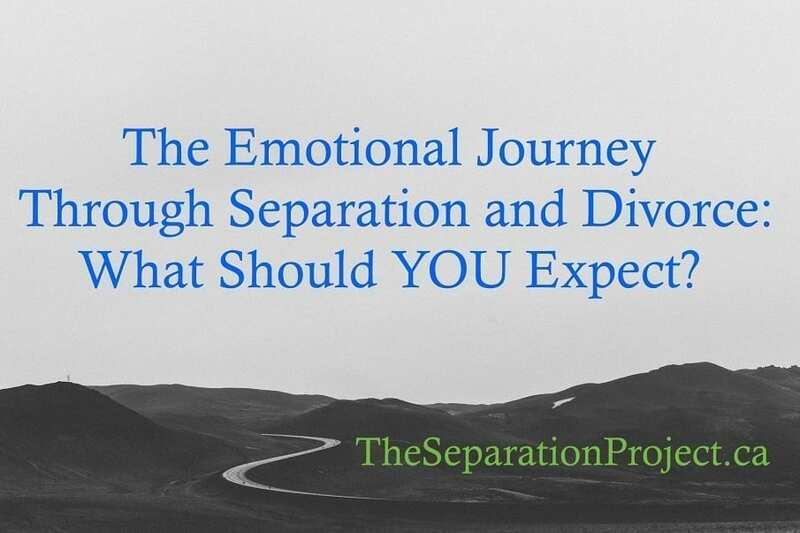 I will describe the normal emotions that my clients usually feel when they go through their separation or divorce as a path through an emotional valley. On one side of this valley is your life up until now. Emotions here are your normal day-to-day ones. I am sure there have been some ups and downs. Good and bad things have happened in your life, but your feelings have probably been fairly manageable and you have been supported by your partner, hopefully in difficult times, when emotions ran high. It was relatively easy to feel healthy and your life and emotions felt ‘normal’. As you begin to get a gut feeling of coming problems and when the thought of a possible separation flickers into your head, you will start down the edge of a steep valley. The first emotion is usually denial. Denial is good in that it does protect you while you adjust to the thoughts you are experiencing. As the reality of a separation sets in, there is usually a steep slide that starts quickly. Shock and denial often come hand in hand and you will usually start to feel anxiety and fear. Loneliness, guilt, rejection and blame may all visit you during your decent. Fear is probably the most dominant emotion as you descend into the valley because your future has become a big unknown. Anger may start and be very overwhelming. Why is this happening to you? It all seems very unfair. Anger can actually be a good emotion to feel at this stage as it makes it easier for you to start taking action to help yourself better your situation. However, vengeful actions fuelled by anger directed at others or yourself are not okay. You have now reached the bottom of the valley and are in full grief. It is essential to grieve the death of your relationship. It is healthy to allow yourself time to adjust and work through all of these emotions as they surface. At the bottom of the valley are confusion, frustration, stress, anxiety, sadness, skepticism, depression, loneliness. All of these things are very difficult to bear. These are the lowest feelings and the darkest places to get through in this valley. Usually, our energy is low and we need lots of rest and self-care. You may need to ask for help to get through some of the difficult emotions you are feeling. I want to emphasize how difficult grief for a dead relationship is, and how it is very normal. Take your time and know that the emotions you feel and believe you have passed through will resurface, probably less intensely and for less time, but it is a bit of back and forth. All that is normal and part of the process. We often talk about the journey as a rollercoaster ride! When you reach the far side of the valley, you start up the other side – a steep climb but a very satisfying one starts with acceptance of the situation. With acceptance, new emotions start to uplift you and help carry you out of the valley. You start to become more creative again. Problem-solving becomes easier as your thinking brain is hijacked less often by the fight and flight response. You may feel more able to negotiate and think things through. More positivity surfaces as your energy starts to return, and you become impatient for your new future to start without all the emotional turmoil you feel now. Enthusiasm will be felt more often and be more sustained. When the healing is well underway, things will all level out again and the new plateau will come into view. Life will become more manageable again and your new situation will become the new normal. You will become comfortable with the way things are. There can be some pretty nice things up on this plateau – it depends on what you are ready for and what you are looking for, but I will tell you that anything is possible! The emotional journey is a very difficult one, but also a very rewarding one. Most people are very surprised at the intensity of their feelings and some people find that they feel very out of control. If you think you need help please ask for it! I find it does help to know that these intense emotions are generally quite normal. If you feel they are too much to manage on your own, you can reach out for help. Take your time and be patient with yourself and all others involved. Help from others, self-care and patience are some of the best strategies for managing it. Remember that your children, if you have any, and your ex will all be having similar feelings, but they may be at very different stages and the timing may not match your experience. Taking into consideration where you both are on the journey will help both communication and negotiations. Note that negotiating will work a lot better when both of you have the most energy scaling up the far side of the valley than in the early stages or the doldrums at the bottom of the valley. Remember that the person left behind in the earlier stages may see the words and behaviour of their ex-spouse who is further along in the valley, as potentially more hurtful than it is meant to be. The journey, if you take advantage of the lessons you are learning, can be a very powerful one. Self-awareness increases. You become reacquainted with your own personal value and strengths. Being challenged to deal with all the difficulties causes tremendous personal growth. You can embrace your newfound status and relish what you have learned along the way. I am a very different person than I was before my journey and am thankful I took the journey myself. It was difficult, but my life now is much more satisfying than it was on the previous plateau! Please share in the comments what have learned about your own strengths and abilities on this journey. I do offer a free strategy session. Please contact me to talk about how my coaching works and how working with me can benefit you!